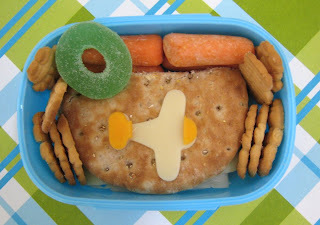 BentoLunch.net - What's for lunch at our house: F&B Made Bentos! Sometimes, they can be so cute! I was in the shower earlier and told Faith I would make lunch when I was finished (because, you know, like most small children, mine ask for things when my head is covered in shampoo). By the time I finished & dressed, she told me they decided that they would make their own lunch (score!) and that they made bentos and that I really should take a picture again and blog it because Ben helped make his too. Will do! Faith has a sandwich on Nature's Own Multigrain Rounds. My assumption is turkey & cheese because I'm pretty sure we only have turkey open right now. She decorated it with a swiss cheese shoe. 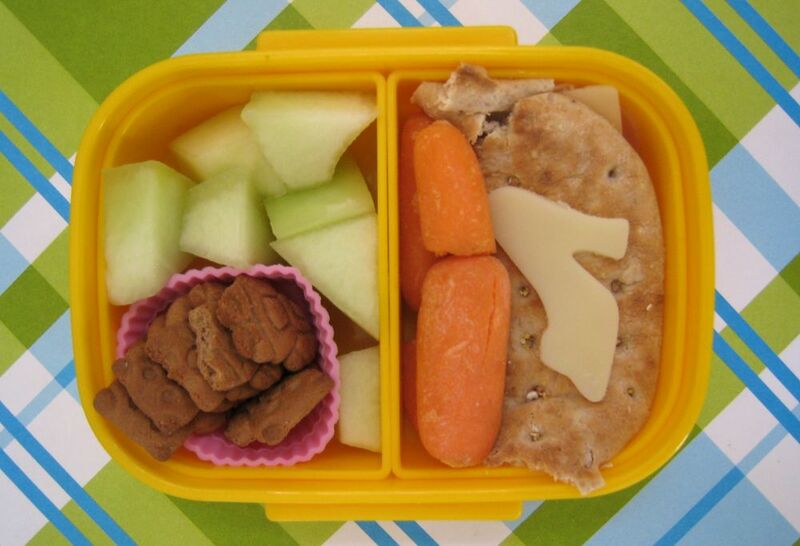 She has carrot sticks, honeydew and some teddy cookies in a silicone cup. Ben has the other sandwich, but he cut out an airplane out of swiss (so I'm told) and Faith helped him add orange decorations to it. He also has carrots & teddy cookies, but he picked a Lifesaver gummy from the Halloween stash. I'm pretty impressed, and they didn't even leave me a messy kitchen! No messy kitchen AND they made it themselves?! I'll say - SCORE! Way to go Faith and Ben! Hi, I have been lurking for weeks now and this post has brought me out! You should certainly be impressed because your kids made such good choices for their lunch. I am trying to make healthy bentos (and healthy meals all around) but I doubt my kids would make their own as healthy. Who knows? I guess I should try it sometime. I am totally impressed. They did a great job.